Adjust walkie leg straddle from 38" to 50" (96.5 to 127 cm) in 4" (10.16 cm) increments to work with various size pallets. Internal 24V battery plugs into standard 110V AC outlet. Fully charge from empty in about 8 hours. The new Morse < PILOT > Self-Propelled Drum Handlers feature intuitive, industry-standard throttle, steering and drum positioning controls. A "Belly-button" switch helps prevent operator being pinned. Upon contact, it activates low speed reverse direction. Lift and Pour a Drum up to 10.5 feet (3.2 m) high. 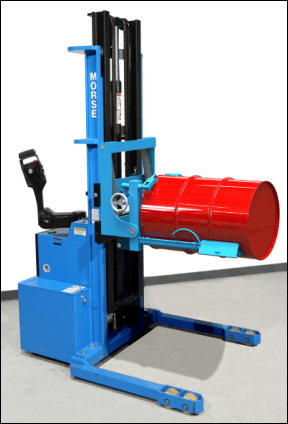 Power-propelled drum handler to transport, lift and dispense a drum up to 10.5 feet (3.2 m) high! Fully invert your drum in just 8 seconds with familiar ergonomic controls. Adds the ability to weigh while you pour, so you can dispense just the amount you need. Scale-equipped self-propelled walkie drum handlers allow you to weigh your drum while you pour to dispense precise amounts as needed. They eliminate the need for a separate weighing station. You control the drum pouring angle and height while you dispense. Rack a Drum Horizontally up to 10.5 feet (3.2 m) high. Power-propelled walkie stacker to rack your 55-gallon (208 liter) steel or plastic drum with top rim up to 10.5 feet (3.2 m) high! 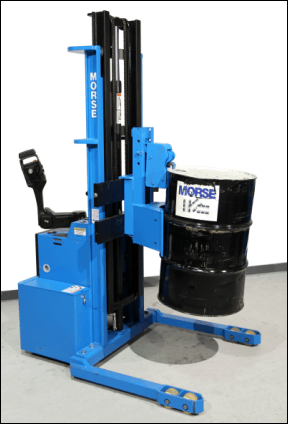 This safety conscious self-propelled MORStakTM Drum Racker, allows you to move drums on and off racks, pallets, trucks, etc. Lift an upright drum and place in horizontal position. Capacity is 800 Lb. (363 kg). Move and Stack an Upright Drum up to 10 feet (3 m) high. Power-propelled walkie stacker to lift and transport an upright drum up to 10 feet (3 m) high. The MORSPEEDTM drum grabber is a proven, safety conscious way to handle drums. 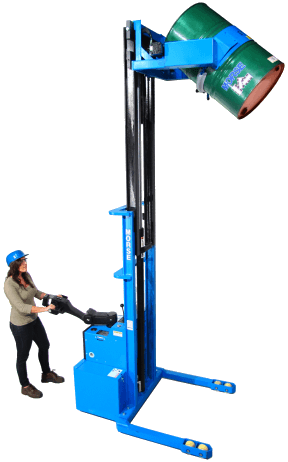 Lift and move almost any rimmed steel, fiber or plastic drum, regardless of diameter. This self-propelled walkie stacker requires no manual contact with drum, utilizing a completely mechanical and automatic drum grab as you raise against the side of your drum. Mechanism automatically releases drum when you set it down on floor, shelf, pallet, etc. Note: Requires a minimum drum height of 24" (61 cm), and minimum drum weight of 75 Lb. (34 kg) to activate the drum gripping mechanism. Capacity is 1500 Lb. (680 kg). * Half-full rating is an indication of capacity for tilting an unbalanced, bottom-heavy drum. Partially full drum with unbalanced and shifting load is harder to tilt than a full drum. Morse < PILOT > Power-Propelled Walk-Behind Drum Handlers. Self-Propelled walkie drum handlers.